"Mexican food is a popular word in our house." 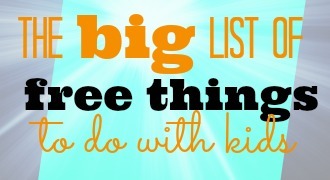 That's what my son said as we laid out four different types of homemade salsa the other day for a salsa-tasting dinner. And why not have chips and salsa for dinner? When there are four different types who needs anything else? If I was to claim myself an expert on anything, it would be chips and salsa. I don't know if that means I have had a successful life thus far or not. Really, that depends on how much you like Mexican food. 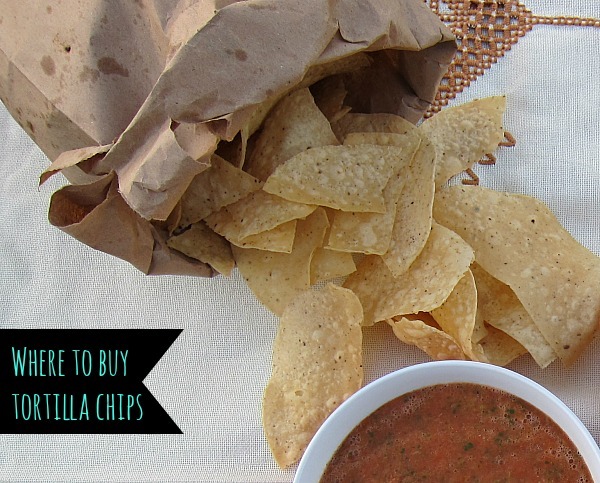 If you really knew me, you'd know that I have been waiting my whole life to write this post about chips and salsa. 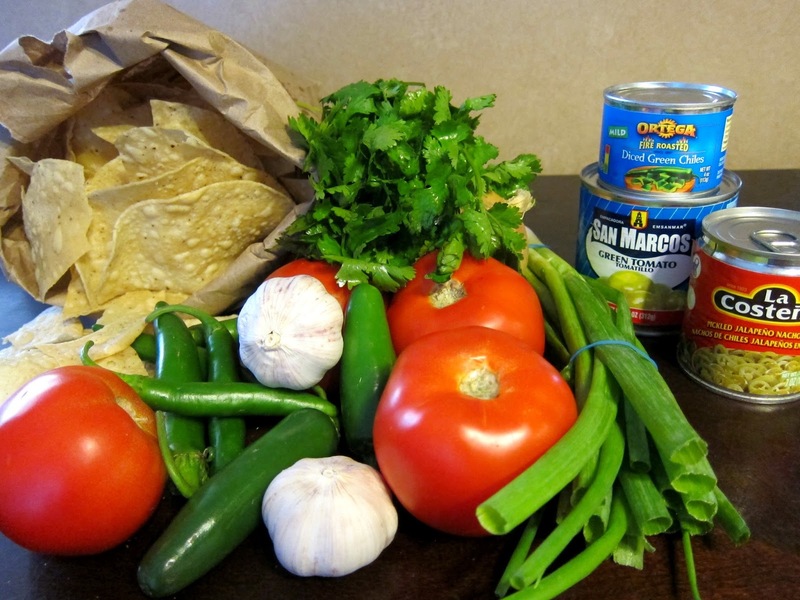 In addition to some great recipes for salsa, there are even tips for buying the very best tortilla chips and a list of some great salsa festivals in Arizona. 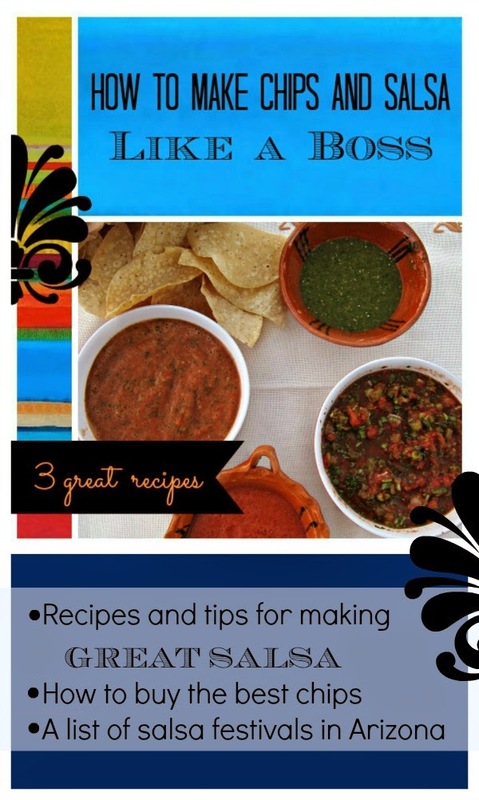 I have tried probably 100 salsa recipes myself and have narrowed it down to three great recipes to share with you. The fourth recipe we made the other night was this recipe for Roasted Red Salsa. The roasted red salsa was yummy, and very spicy even after I reduced the amount of serranos. Just so ya know. A picture from my trip to Pro's Ranch Market for salsa ingredients. Each of these recipes has its own unique flavor. At my house, everyone had a different favorite. We served our salsa bar with this delicious Brazilian Lemonade. It was a pretty fun night. This is a favorite recipe that people love. It is a mild salsa, but of course you can add more jalapenos if you'd like to kick up the heat. The recipe makes a lot and can be halved for a smaller batch. Start by chopping your stewed tomatoes and cilantro. I like to put these together in a food processor and pulse a few times until they are to my desired consistency. Add remaining ingredients. Done. This recipe is a family favorite from my mother-in-law. Kids tend to love this salsa because it is fairly sweet. 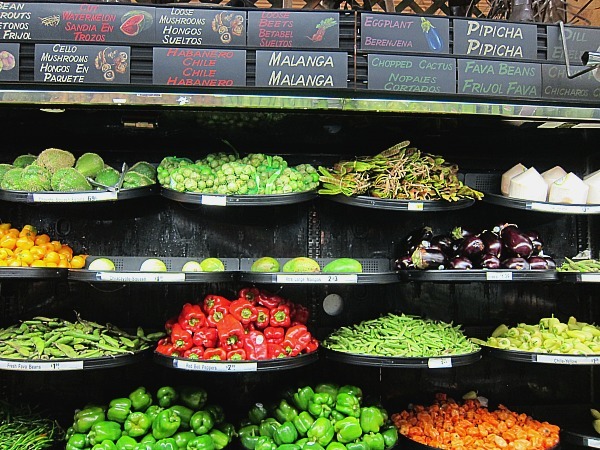 Canned tomatillos can be found in the Mexican food section of your store. You can definitely find them at Mexican grocery stores but they are pretty widely available in Arizona even at many other stores (I get them at Fry's generally). I've also used fresh tomatillos and cooked them myself to make the salsa. Put everything in a blender and blend thoroughly. Add additional sugar and more jalapenos to taste. I like it sweet so I always add more sugar. 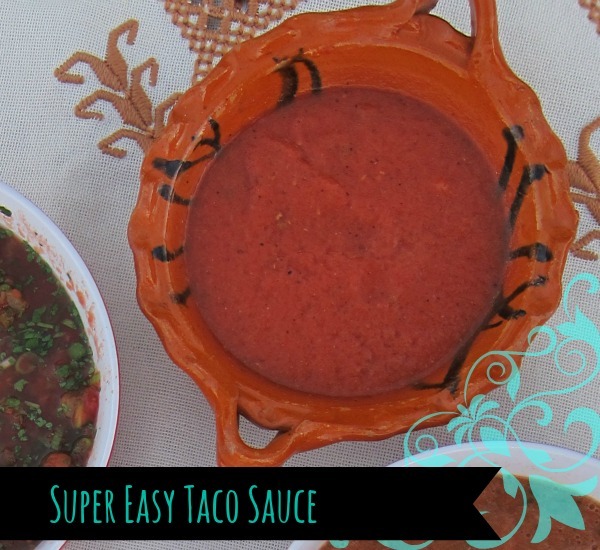 This is one of my favorite new salsa recipes because it is so simple to make and very easy to keep the ingredients on hand. Although I call it a taco sauce, it is very good just with chips too. This is something my husband will whip up after the kids go to bed and we eat with some homemade tortilla chips. Yum. Heat a small skillet on the stove. Place your jalapenos and cook for a few minutes, turning a bit to cook all all sides. You want to get the peppers charred and cooked a bit all the way around. Cool slightly, then trim the stem off and remove the seeds and veins. Chop roughly and place jalapenos, canned tomatoes, and a little garlic salt in a blender and blend until smooth. Taste and adjust flavors as needed, adding more garlic salt or adding some of the jalapeno seeds in to add more heat. I find it's always easier to leave the veins and seeds out and then add back in what I want til it's the perfect temperature. 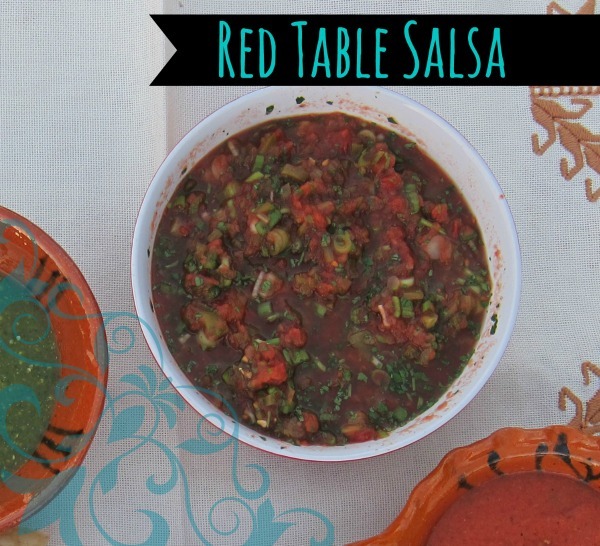 Click here for a printable version of all three salsa recipes. A list of SALSA FESTIVALS in Arizona. In order to have a really great chips and salsa bar you are going to need the right chips. Any old bag from the grocery store won't cut it. My Nana's. These are the only chips I buy from a traditional grocery store. I have seen them at Safeway, Fry's, and Bashas either on an end-cap or near the bakery but not in the chip aisle. They also sell a large bag of My Nana's at Sam's Club for a great price. 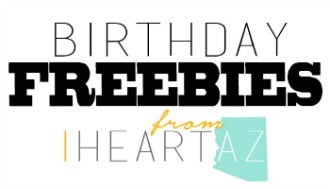 They are made from a local Arizona company so it's a no-brainer. Dos Ranchito's. These chips are made fresh at your local Food City store. They are restaurant-quality and delicious. Order a bag of chips to go from a restaurant. You know those light, thin, crunchy chips from your favorite Mexican restaurant? 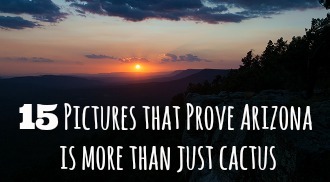 The best place to get them is, not surprisingly, from your favorite Mexican restaurant. The prices are generally really good too--comparable to grocery store chips but much better. 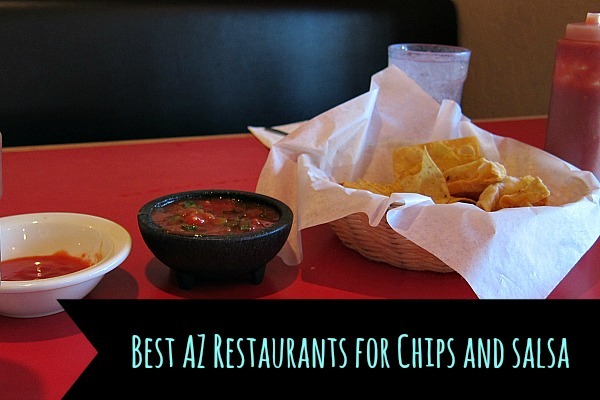 Serrano's (several East Valley locations) -- The salsa and bean dip are both great. 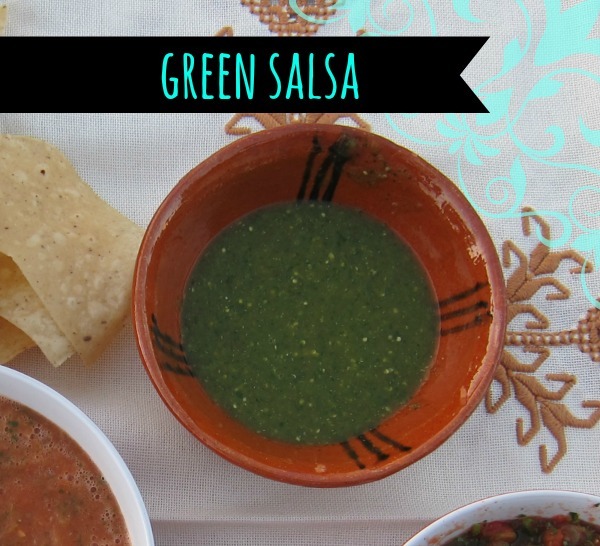 Tia Rosa (Mesa, Gilbert) -- The green salsa! Gecko Grill (Mesa, Gilbert) -- Green salsa and bean dip were both recommended. 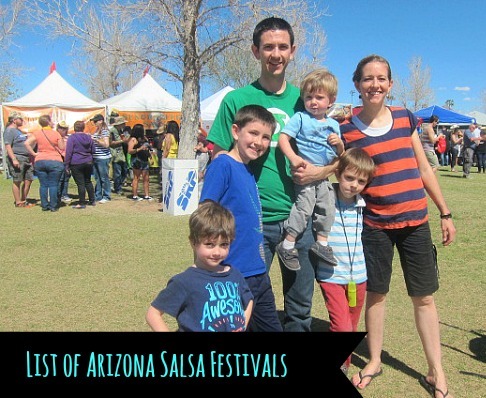 For the ultimate chips and salsa experience, check out one of these festivals! We go every year to the My Nana's Salsa Challenge. It is my favorite festival of the year and I honestly look forward to it like Christmas (probably more). Salsa Fest (September in Safford). Head to the Salsa Trail in Safford, AZ, a place well-known for their Mexican restaurants. The Salsa Fest happens every September, and this year the dates are the 26th and 27th. 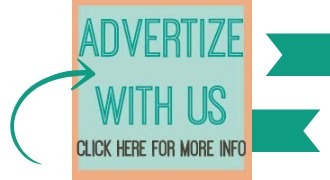 Other activities in conjunction with the festival include a salsa walk, kids corner, car show, and more. My Nana's Best Tasting Salsa Challenge. Taste over 100 freshly-made salsas for one entry price. There is also a fun kid zone for a modest price. Generally happens in March at Tempe Beach Park. Southern Arizona Salsa & Tequila Challenge. This event is a nicer culinary event, and not really a family festival like the other two. Along with gourmet and classic salsa and tequila tastings, there is live music, a pinata competition, folkloric ballet dancers, and more. 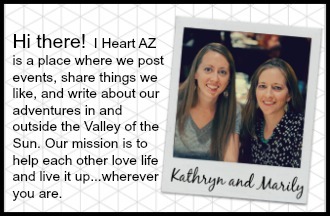 It happens every August in Tucson, and unfortunately, we just missed the event for this year but put it on your calendar, it sounds like a great night.